Proper planning is essential to creating financial retirement security. But according to a recent GoBankingRates survey, 42% of Americans risk reaching retirement age, without adequate savings to see them through the rest of their lives. And nearly half of Americans polled had less than $10,000 set aside for their later years. Fortunately, a sound financial plan can remedy this situation. Creating a retirement plan requires first carefully evaluating your existing assets, including cash savings, employer pension funds, annuities, and retirement accounts like 401(k)s or individual retirement accounts. It's also important to assess your physical assets, such as homes, cars, antiques, collectibles, land, and anything else you may sell to generate retirement income. Sell your car and use ride-sharing services, to eliminate car payments and insurance bills. Discontinue your landline telephone and acquire the cheapest possible cell phone plan. Raise the deductible on your homeowners' insurance policy, to lower premium costs. Take advantage of senior discounts. Sign up for Medicare as soon as you're eligible, to reduce out-of-pocket health care costs. Choose generic products over name-brand merchandise. Making inexpensive home improvements that increase energy efficiency and reduce utility bills. For example: purchase a programmable thermostat or replace attic insulation. If you're headed into retirement with debt, be strategic about paying it off, when you have some extra bucks. But while it may be tempting to funnel all extra money towards relieving debt, it's equally important to maintain a financial cushion for emergencies. For this reason, the best option may be splitting your money between retirement savings and debt payoff. If you have financially assisted adult children or grandchildren in the past, consider curbing this generous impulse. Communication will go a long way in helping your loved ones understand your shift towards prioritizing your own financial future. If you're retiring without substantial savings, Social Security will probably be your primary source of retirement income. You may receive benefits as early as age 62, however, this triggers a reduction of your benefit amount. If you elect to take benefits early, consider earning supplemental income by working part-time. Just be aware that working while claiming Social Security may result in your benefits being temporarily reduced if your earnings exceed the allowed threshold. If you've built up substantial equity in your home, you can create income through a home equity loan or a line of credit, however, these must be repaid by you, at a later time. Alternatively, you can obtain a reverse mortgage, which generally doesn't require you to make payments, unless you're no longer living in the home. 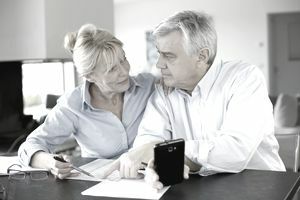 When you pass away, your heirs would be responsible for either repaying the reverse mortgage outright if they wish to keep the home or selling it and using the proceeds to repay it. Finally, consider renting out a room or part of your home on Airbnb. Just remember to check your local zoning laws, to make sure this is permitted. Also, don't forget to consider the tax implications of claiming Airbnb rental income.